PRESIDENT TRUMP, Gov. 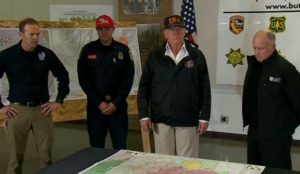 Jerry Brown and Gov-elect Gavin Newsom are assessing wildfire destruction in Paradise, CA with Cal Fire officials. November 17, 2018 – Credit to Fox 40 News. 4 Responses to PRESIDENT TRUMP, Gov. 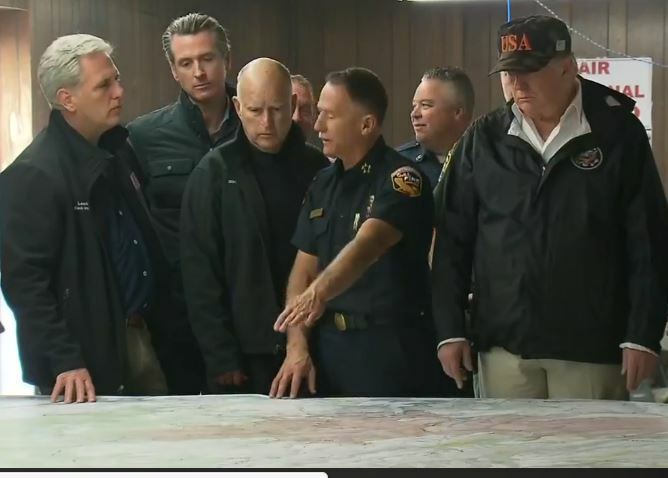 Jerry Brown and Gov-elect Gavin Newsom are assessing wildfire destruction in Paradise, CA with Cal Fire officials. I recently read that clearing around a building, up to around 100 feet from the building drastically reduces the chances of materials on the building to ignite and that the number one reason buildings catch fire is due to things like pine needles and leaves on the rooftop. The issue is mainly that the embers that are carried in winds end up landing on rooftops and normally would go out but if there is fuel there, it can ignite. Apparently you didn’t get the sarcasm in my comment. What you read recently is what Cal fire has been telling us for years. It’s called defensible space, And it is pretty much common sense. And as far as clearing up to 100 feet away from structure’s, Well unless you own a lot of land that is merely impossible. My lot is 3/4 of an acre. And although I have removed all trees and brush on my property I am surrounded by empty forested lots that I can’t do anything about. I currently live about 100 miles from from where Trump was visiting today. Again people, if you have an RV, trailer or rig that can be used as a bug-out vehicle, get it prepared. I’m re-assembling the top-end of engine right now in preparation of having to leave if the fire gets too close.